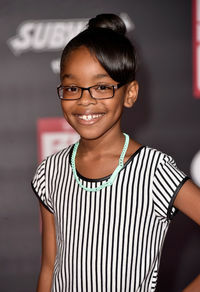 14-year-old Martin, will become the youngest executive producer in Hollywood history with the release of "Little”, according to Ebony Magazine. The Movie, “Little”, is a play on Tom Hanks’ 1998 film “Big”. For those who are not familiar, it’s similar to the movie, Freaky Friday, that stared Lindsey Lohan and Jamie Lee Curtis in the 2000’s. Although this time around, the cast has some extra melanin, including Martin herself. She will be the star of the movie along side co-stars, Regina Hall and Insecure creator, Issa Rae. “Little” is about the life of Regina Hall’s character as a tuff, outspoken and sometimes rude business woman, who wakes up to find herself as a 13-year-old, played by Martin. It’s intended to be a fun filled movie with tons of laughs and life lessons. Some are eager for the movie’s release and have said, its not often we have a cast of black actresses that star in major motion pictures. The Movie “Little” will hit theaters April 12th.